Visit the famous waterfalls and crater lakes of the Atherton Tablelands. Tour includes: Curtain Fig Tree, Lake Eacham, Lunch, Millaa Millaa Waterfall, The Crater and Mt Hypipamee National Park. 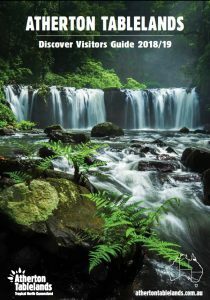 Includes your guide, morning and afternoon tea, lunch and all National Park fees. Sunset Ridge Farm – taste a variety of homemade breakfast treats made from all these fruits and you can purchase some of their delicious Davidson plum jams and marshmallows unique to this region. Next stop we are heading to the scenic outskirts of the Historic rural town of Malanda to a private property to taste Gallo Cheeses with their signature condiments utilising locally grown Davidson (Ooray) plum, lemon aspen (rainforest citrus), lillypilly (rainforest berries) and rainforest (Boonjie) tamarind in traditional artisanal recipes infused with the unique qualities of Australian rainforest fruits. Lunch at Australian Platypus Park, home to a thriving platypus population. Visit Gallo Dairyland where you can buy the delicious cheeses that we have just tasted and sample irresistible Swiss style filled chocolates that are a work of art whilst gazing out over the picturesque landscape. Visit Mount Uncle Distillery, North Queensland’s first and only distillery. Here we taste some of their Award winning liqueurs and spirits. Next stop is De Bruey’s Boutique Wines located near Mareeba on a 15ha mango orchard cradled between the peaks of the Great Dividing Range. All wines are made on site using a blend of tradition and innovation which produces high quality wines from a rich diversity of tropical fruits. Final stop for the tour is Jaques Coffee Plantation with 85,000 Arabica Coffee trees growing in the rich soils they produce a smooth and vibrant flavour unique only to the remarkable location. Here we get an enchanting insight in to the finer details of coffee from the tree to the cup. We stroll through the gardens and finish our stop with a delicious cup of Jaques coffee made ‘just as you like it’ with scones, local jam and Mungalli cream. Lunch and all wine, cheese, coffee, chocolate, fruit “TASTING” included. Gluten free lunch and lactose free cheese available on request.